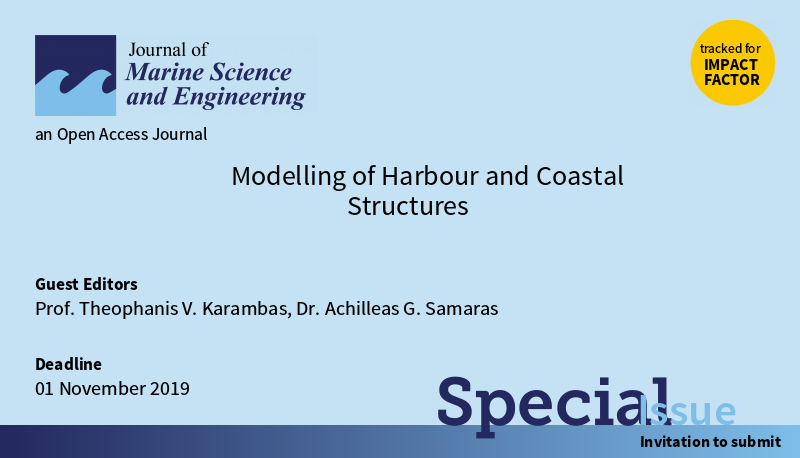 I am really glad to announce the launch of the Special Issue entitled "Modelling of Harbour and Coastal Structures" in the Journal of Marine Science and Engineering (Publisher: MDPI), with Prof. Theophanis V. Karambas and myself as Guest Editors. Harbour and coastal structures design and upgrading (seawalls, revetments, bulkheads, jetties, emerged/submerged groins and breakwaters, artificial reefs, etc.). Wave agitation and siltation problems in harbour basins and approach channels. Shoreline erosion control downcoast of harbours. Research articles, review articles and case studies are welcome; contributions can be based on numerical, physical or combined numerical and physical modelling. The deadline for manuscript submissions is set to November 1st, 2019. More information are available at: Link. The Special Issue flyer can be downloaded from: Link. Paper [J.17] "Coupled wave - 2D hydrodynamics modeling at the Reno river mouth (Italy) under climate change scenarios." by Gaeta et al. published in Water (Publisher: MDPI). Upcoming presence with two Oral Presentations at the International Conference Protection and Restoration of the Environment XIV, which will be held in Thessaloniki (Greece), from July 3rd to the 6th, 2018. The video of my recent talk "Skeletons & Elephants in Libraries" at the Athens Science Festival is now available online, at: Link. Interview on science, research and science communication by Reader.gr, in view of my talk "Skeletons & Elephants in Libraries" at the Athens Science Festival. The interview - unfortunately only for Greek speakers - can be found at: Link. Upcoming talk at the Athens Science Festival, which will be held in Athens from April 24th to April 29th, 2018. Paper [J.15] "An integrated numerical model for the design of coastal protection structures." by Karambas and Samaras published in the Journal of Marine Science and Engineering (Publisher: MDPI).